Today’s was inspired by my first trip to Franco Manca in Brixton. I ordered the daily vegetarian special, which was buffalo mozzarella and wild garlic pesto. It was so simple, but the incredible quality of ingredients they use made it so memorable. I still dream of wild garlic pesto! So I’ve created a 15 minute version which I think you’ll love! 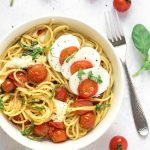 I’ve used chives instead of wild garlic, because they are so much more accessible, and instead of a pizza sauce we’ll make this caprese style with fresh cherry tomatoes. 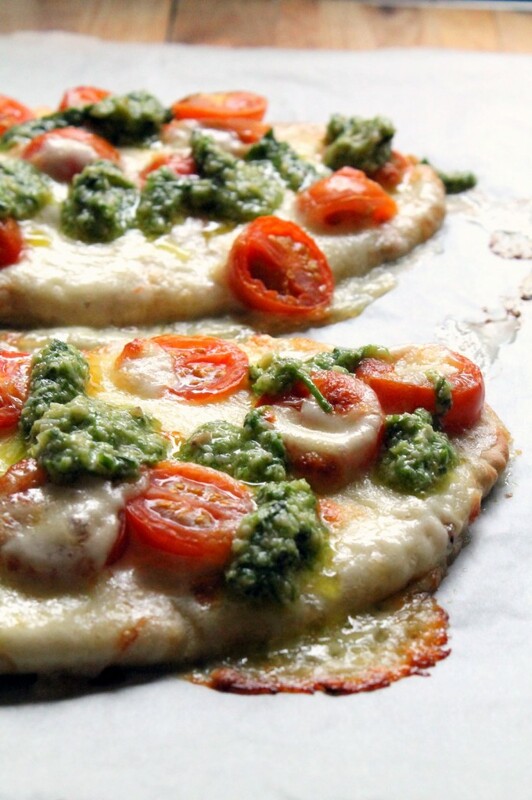 Using a really high quality mozzarella will pay off in this recipe. With so few ingredients, each has a chance to shine. So if you have the budget for it, go ahead and do that! But it’s not essential. I used a cheaper store brand mozzarella today, and it was still amazing. You can get this on the table in 15 minutes. 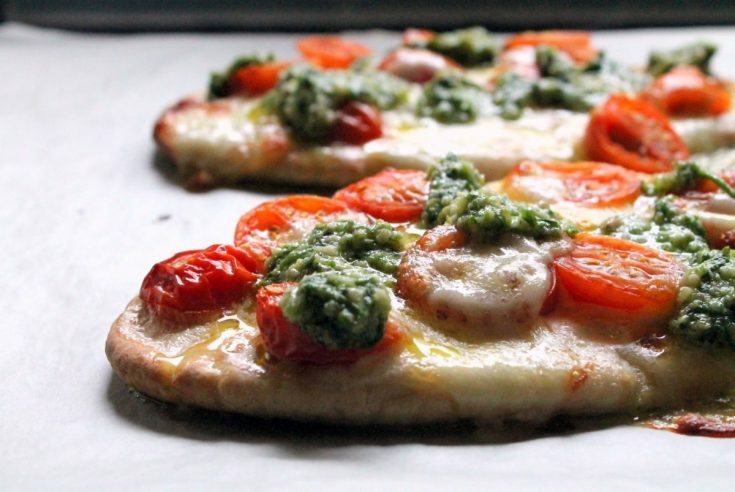 The first 5 minutes you’ll spend pre-heating your oven and chopping the tomatoes and mozzarella. 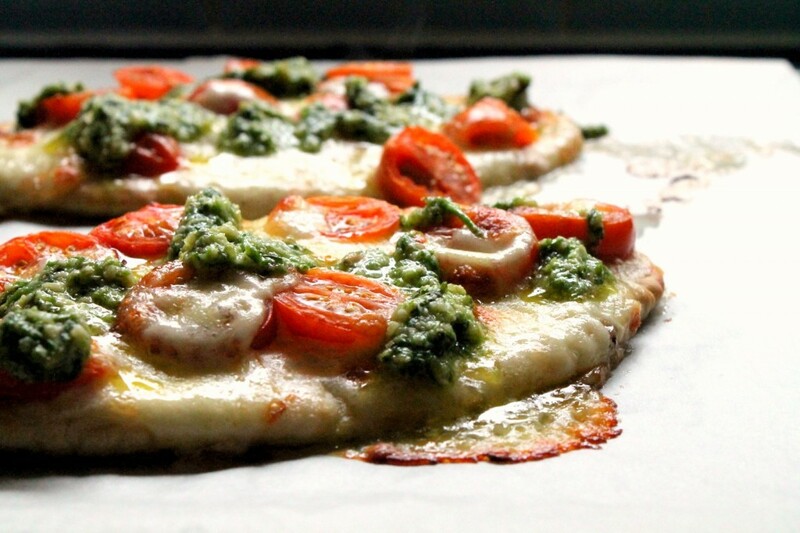 The next 10 minutes you’ll spend preparing the pesto while the pizzas are in the oven. 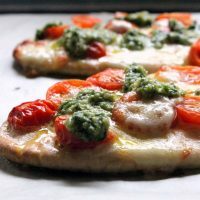 A quick and easy pita caprese pizza which can be put together in 15 minutes (including making the chive pesto from scratch)! 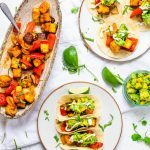 A fresh, healthy and extra tasty vegetarian lunch or snack! Pre-heat your oven to 200C / 390F. Meanwhile, slice the cherry tomatoes into thirds and roughly chop your mozzarella. 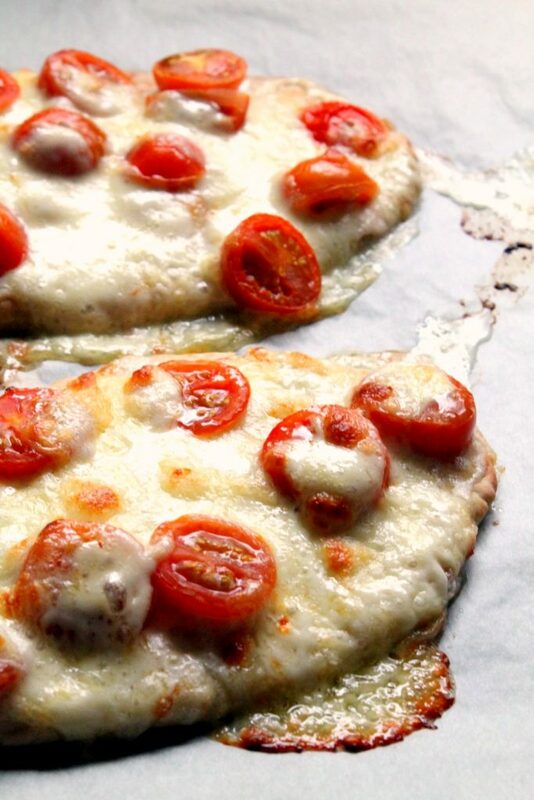 Assemble the cherry tomatoes and mozzarella on top of the pita bread. Place on a baking tray, and put in the oven for 10 minutes. 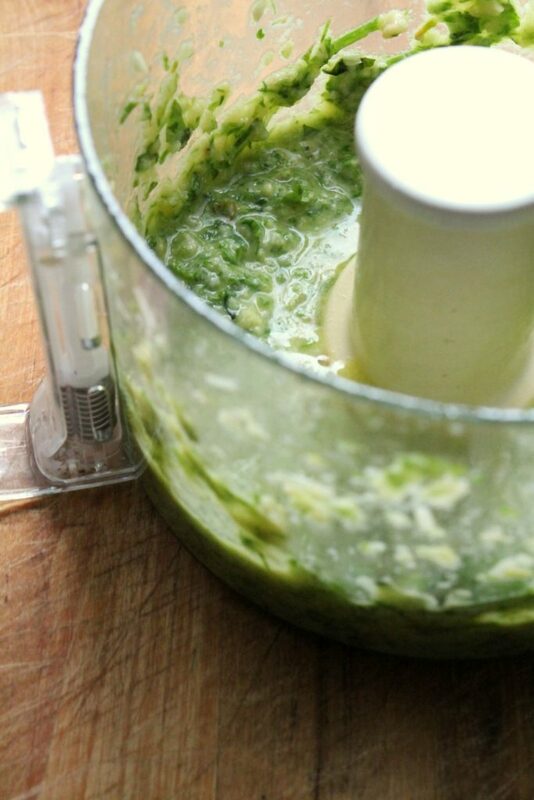 Meanwhile, make your pesto by blitzing all of the ingredients in a small food processor. 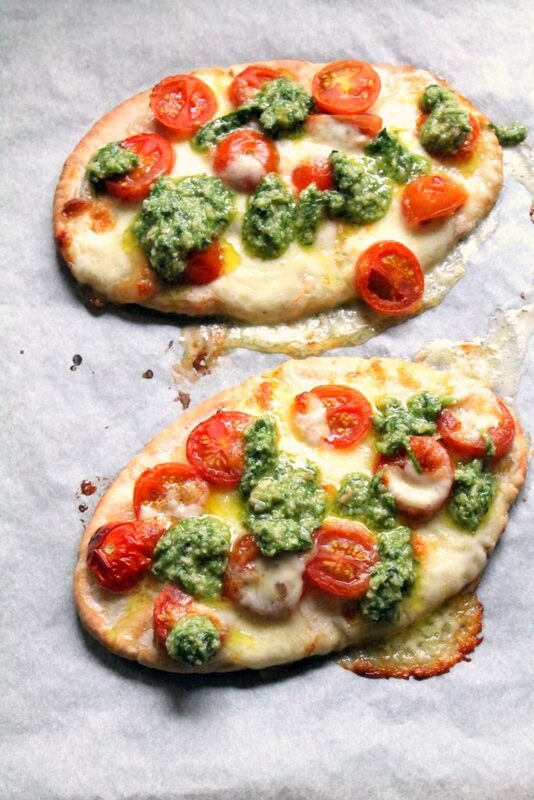 When the pizzas are ready, spoon the pesto on top. 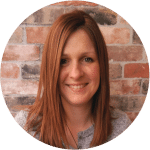 The pesto recipe uses measuring cups, because volume measurement seems easiest here- but if you're a metric purist and don't own any, a standard mug is about 1.3 cups, and a cup is 16 tablespoons, so that should give you a sense of things. 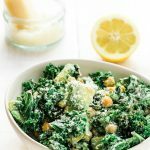 And the pesto doesn't need to be too exact, it's a very adaptable recipe! You will probably have some leftover pesto. 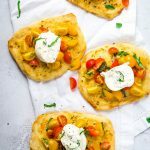 If you’re digging the caprese pizza concept but have a little more time – head on over to my caprese pizza with buttermilk crust recipe. It’s one of my all-time faves! I also have a Truffled Portabella Mushroom Pizza if you’re feeling like something more fancy. I love, love, LOVE these pizzas! I adore pesto but have never tried chive pesto before; amazing. 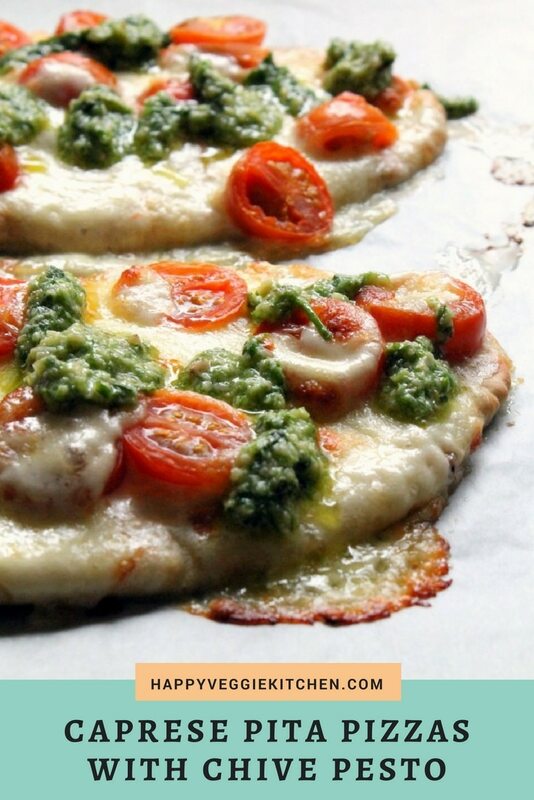 And I always put pesto on my pizza under the cheese. I had never considered putting it on the top before. Looking forward to making this with garlic scapes next summer when my garlic is growing.